"Days of the Fallen Sun "
The Junius Letters appearing in the "Public Advertiser" from 1769 through 1772 were libertine to the less reproachful connotation of the phrase, calling colonial English to rebuke conservative government and moreover, to be aware the monarch régime was infringing upon their human rights. Ironic, then, that one of the hubs of impending American liberty, Boston, later birthed the art metal foursome, JUNIUS. Since 2003, JUNIUS has made a sophisticated, if modest name for themselves. Not that this band needs classification, but they sit within the ill-termed "post metal" bracket fortified by NEUROSIS, PELICAN, ROSETTA, MOUTH OF THE ARCHITECT, BALBOA, RED SPAROWES and the defunct ISIS. Yet JUNIUS bathes in their own sonic ether, bred from a mutual love of HUM. Part of their distinct sound has to do with the unique pitches of Joseph E. Martinez, who can scream with the best of them whenever JUNIUS' compositions grow agitated. However, his composed and commanding cleans, reminiscent of eighties alternative heyday, are his calling card. He plays his vocal cards like a straight flush on the band's latest EP, "Days of the Fallen Sun", a short, but grandiose teaser for what fans are hoping produces a forthcoming full-length barnstormer. Yes, two of the songs are generated from JUNIUS' previous splits with ROSETTA and JUAREZ, but presented together in this EP format, there's a succinct flow to "Days of the Fallen Sun" that makes it well worth taking in. Even when darkening up his tones in the first few bars of the EP's final number, "Forgiving the Cleansing Meteor", Martinez escapes his primary monotone palette to recapture the plying aspiration staked earlier on the ascending and wondrous "The Time of Perfect Virtue" and "A Day Dark With Night". Martinez's synths and guitars, as ever, represent the core of JUNIUS' encapsulating awe. His sidearm Michael Repasch-Nieves and bassist Joel Munguia (by now an apparent mainstay after the revolving door of four stringers before him) add blurring strokes that illuminate the flaring dramatics of JUNIUS' shoegazing epicenter. Drummer Dana Filloon methodically clocks the seeping pace of "Days of the Fallen Sun", knowing perfectly well when to smash harder than he already does on the verses. Collectively, the band ignites during the climax of the 7:34 "A Day Dark With Night", pared down from its original 8:05 running time on the 2011 JUNIUS/ROSETTA split. It chimes as the most poignant moment of the EP, even with the concussive density of "Battle in the Sky" that rings of the DEFTONES at times and bursts emotionally with Martinez's screeches and clattering bell tones. In-between the songs are brief, atmospheric instrumentals that range from translucent coldwave, i.e. "(Meditations)" and "(The Purge)", to the synth-choral mass blossoming through "(Shamanic Rituals)" and the caressing key brushes of "(Nothingness)". Each sets up the main selections that link to and gestate from them. 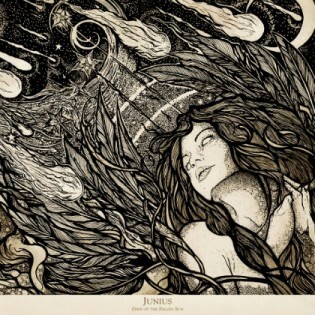 Even while revisiting past material, JUNIUS exhibits a tremendous mastery of elegance and force with "Days of the Fallen Sun". As an EP, it is gratifyingly cohesive, textured and self-contained. JUNIUS are hardly libertines as related to the most common use of the word, but they certainly do open the mind and call their listeners to ascribe to something higher than what the world offers at face value.